The SDL Connect 2017 conference was held in San Jose, California. 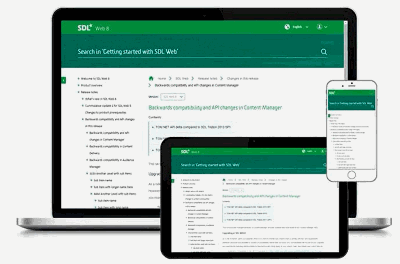 Connect is a yearly user and partner conference where language and CMS technology provider SDL announced their strategy and roadmap for the coming year(s). Below some notes from the sessions that I attended. One of the most visible changes is bringing back the Tridion brand. 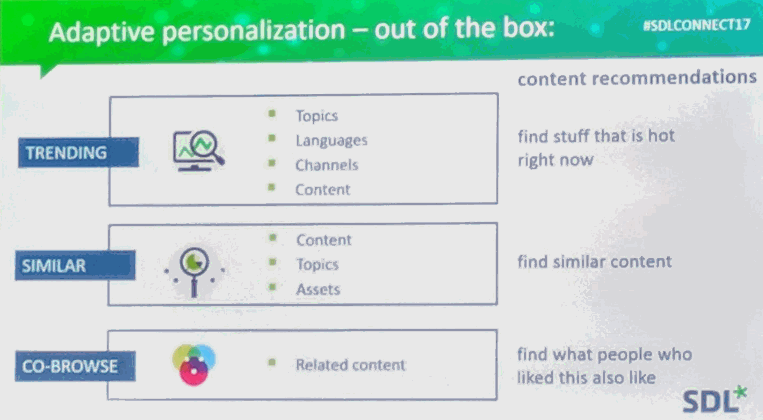 At SDL Connect they announced the new SDL Tridion DX digital experience product. The product is actually a suite that combines web content management (SDL Tridion Sites) and DITA-based structured content management (SDL Tridion Docs). Tridion DX contains a unified experience layer with the support of Tridion Open Content API targeted to any digital touchpoints: mobile, desktop, watches, bots, in-store displays, etc. With these APIs, it is possible to create content mash-ups blending marketing content, commerce content and product information. All this information can be personalized by leveraging AI and Machine Learning capabilities. Tridion DX will be launched mid-2018 and will replace their 2 current content products SDL Web and SDL Knowledge Center. 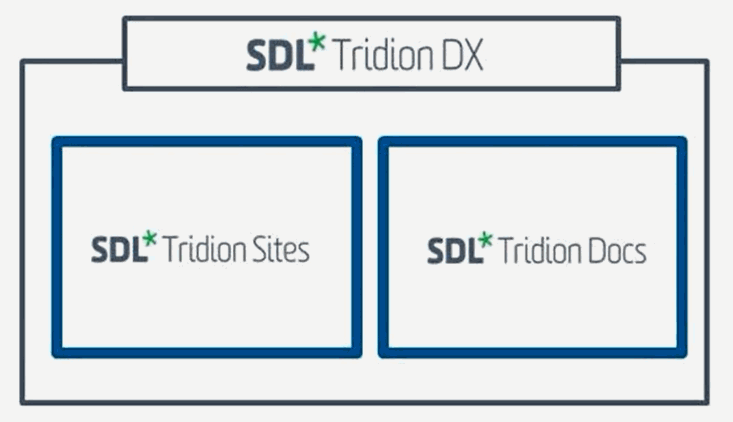 Until that date there can still be some confusion, since marketing will only use Tridion DX, but the underlying product names stay a bit longer: SDL Web 8.5 and SDL Knowledge Center 13. Tridion Docs will be the new name of SDL Knowledge Center (KC) by mid-2018. Until then the product will still be named KC version 13. Knowledge center is a product which enables companies to manage technical content (i.e. manuals) in a structured way. The product supports the industry standard Darwin Information Typing Architecture (DITA), which is an XML based structure to create, produce and publish information. Publishing targets are typically documentation portals, download centers, and support sites. Tridion Sites is the content management system that is formerly known as SDL Web 9. It is mostly used for managing multi-language/branded content for marketing and commerce sites. By combining both Sites and Docs in Tridion DX the content silo boundaries are removed and content managers have a more unified experience when working with content. For the customers of the content, this change will also be noticeable since the pre-sales marketing content is more aligned with the post-sales product content. Experience regions can be used to partition a page. The regions are user-defined and customizable per page template. 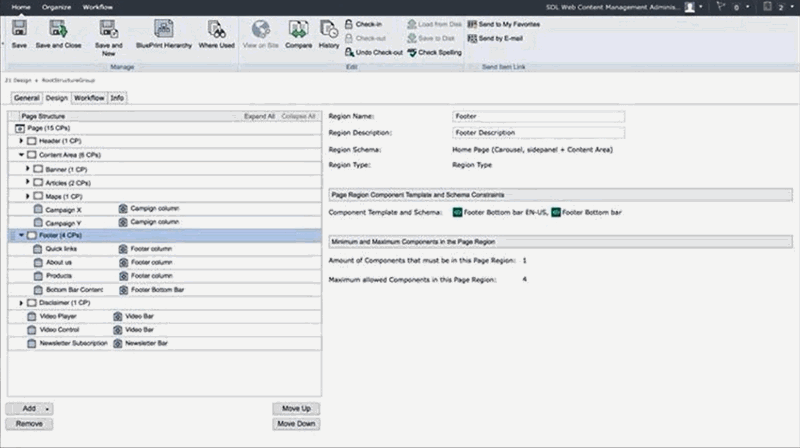 A region can be used to position components in a certain area of a page. Regions can also be restricted to be only used for e-commerce integrations. Image editing support (basic manipulations like cropping, rotating and scaling). The manipulation is stored in the metadata and source image is untouched. Tridion Open Content API for creating content mashups. Adaptive Personalization by using real-time AI and Machine Learning technology. See picture below. During the West Coast community meetup, SDL showed that they are very busy working on a new UX design for their Content Management Explorer. The first UX drafts are very promising and radically changing the way we work with the CME. Also, they emphasized the goal of open API based platform with connectors for extensibility. The downside is that we need to wait until Tridion DX 10 is announced to see what they can deliver since it's quite a big step. 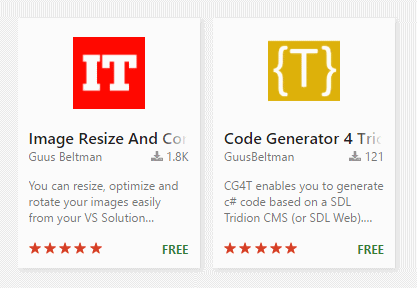 Today I launched a new Visual Studio extension: CG4T, which stands for Code Generation for Tridion. I created some pages which explain it all in more detail. Check the CG4T introduction page or view the VS Marketplace page here. Happy coding to you all! DXA is a reference implementation from SDL to use with SDL Web (formerly known as SDL Tridion) content management system. It uses DD4T and implements best practices on how to setup a site in SDL Web. Great, but what is it for? DXA stands for Digital eXperience Accelerator and is developed/supported by SDL. Its goal is to speed up CDS implementations by standardizing solutions and showing best-practices. DXA is an Open Source project which utilizes either .NET MVC or Spring MVC to provide dynamic content delivery on the CDS, depending of your technology stack. DXA is open sourced on github and DXA documentation is available online. Works best for new implementations. The CMS installer adds a default blueprint structure to separate concerns. 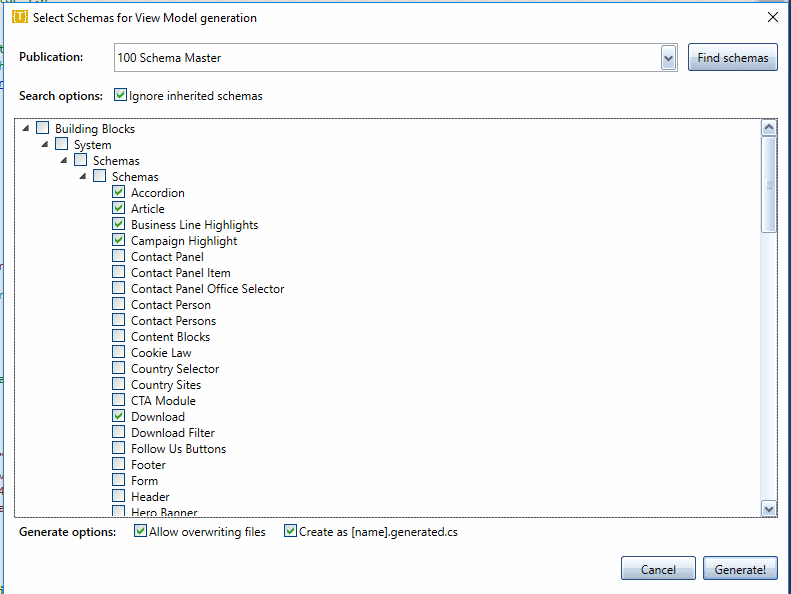 Each publication contains the necessary building blocks required for content assembly: structure groups, schemas, folders, components, and pages. When you publish you get the sample site that showcases the DXA’s "out of the box" functionalities with dummy content and white label HTML design. This could be the starting point for further development.